A stroll along El Malecón -- Lima’s scenic cliff top walkway -- provides the perfect escape from all of the capital’s big city boisterousness, pollution, and noise. This coastal path, which stretches for almost six miles, runs in three connected segments along the Pacific-facing edge of Miraflores, one of Lima’s upscale districts and a popular base for foreign tourists. The southernmost section of the Malecón is the Malecón Armendáriz, also known as the Malecón de la Reserva, which borders the district of Barranco. Head further north and you’ll cross the Villena Rey Bridge to the central section of the Malecón, Malecón Cisneros. North of this is the third and final part of the coastal path, the Malecón de la Marina. The views all along the Malecón are impressive whatever the weather in Lima. On a clear day, you can see far along Lima’s gently curving coastline and a good distance out to sea. On one of Lima’s typically overcast days, the views -- though shortened -- can sometimes be even more dramatic. 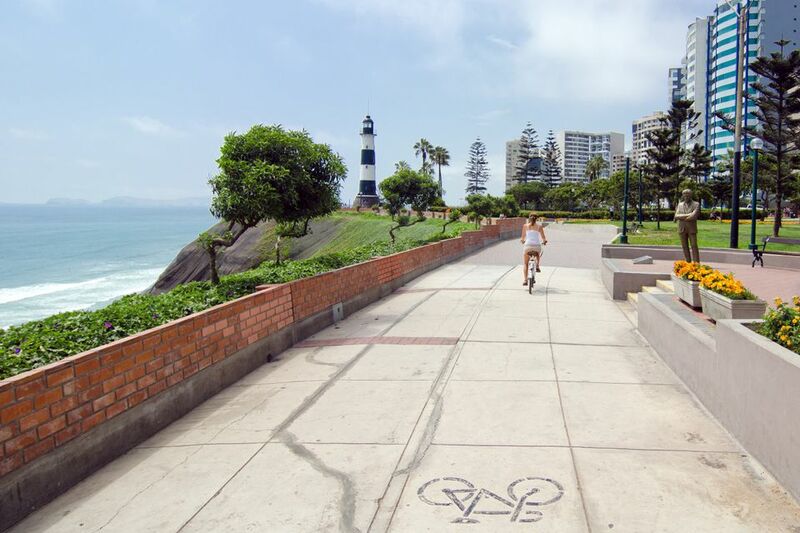 The entire strip is a popular route for joggers, skaters, and cyclists (you can rent bikes at Bike Tours of Lima), as well as couples, families, and individuals just out for a stroll in the ocean air. Dotted along the route are plenty of parks, sculptures, cafes and a lighthouse, so there’s always something to see and a pretty place to sit to enjoy the view. Seven or eight large parks, many with colorful flower gardens, sit along the course of El Malecón. Also keep an eye out for the various sculptures along the route, made by some of Peru’s most famous artists. To the south on the Malecón de la Reserva, you’ll find Parque Domodossola and the more famous Parque Salazar, which is home to the popular Larcomar Shopping Center (with restaurants, bowling, a cinema and more) and a handful of sculptures. Then, just before crossing the Villena Rey Bridge, look out for the sculpture “Amarre” by Limeña artist Sonia Prager and “Intihuatana” by Fernando de Szyzslo. A little further north over the bridge on the Malecón Cisneros are two popular places to relax: the Parque del Amor and the large Parque Antonio Raimondi. 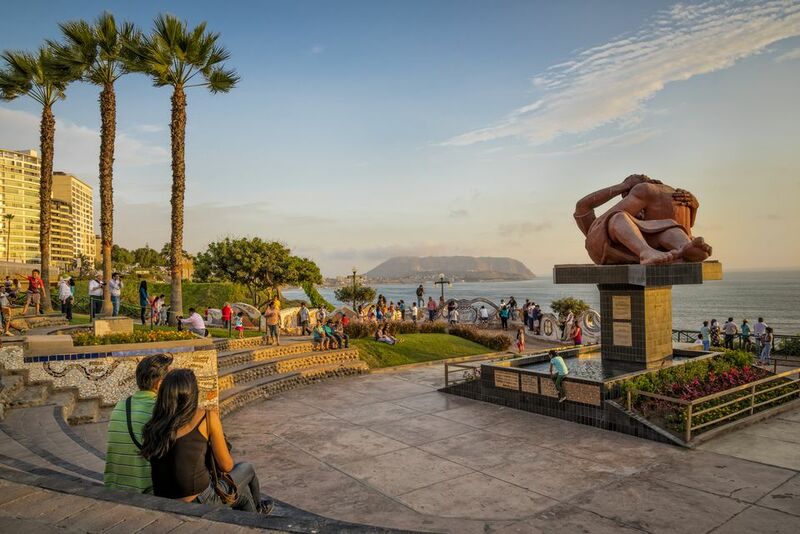 The former, as the name suggests, is a romantic spot for canoodling couples, with its large sculpture “El Beso” (“The Kiss”) by Peruvian artist Victor Delfín. If you want to add a little adrenaline to your seafront stroll, head to Parque Antonio Raimondi, the hotspot for paragliding in Lima. The largest park on the Malecón de la Marina, the northernmost section of the Malecón, is Parque Miguel Grau, named after Peru’s greatest naval hero. The Faro la Marina, probably the most famous lighthouse in Peru, is located at the northern end of Parque Antonio Raimondi on the Malecón Cisneros. Built in 1900, the blue and white striped cylindrical tower rises up to a height of about 21 meters (just under 70 feet) -- not huge, but big enough to serve as an interesting landmark along El Malecón. Finally, perhaps the most obvious -- and largely unavoidable -- landmark along El Malecón is the Villena Rey Bridge, which connects the Malecón de la Reserva and the Malecón Cisneros. It’s not the prettiest of bridges, but it gets the job done for cars, cyclists, and walkers. Inaugurated in 1968, the 104-meter single-arch Puente Villena Rey passes over a busy road that cuts down from the upper part of Miraflores to the main highway running alongside the beaches below.